For some tours a vehicle is required, for the others it is optional but could save time and make your program more intensive and interesting. We are pleased to offer you cars, minivans and buses of the latest models – mainly Mercedes or BMW* – new, clean, comfortable, with air conditioning. 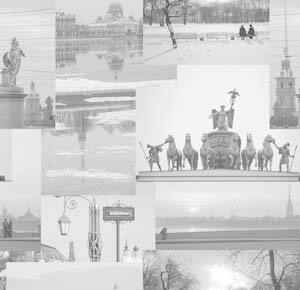 We cooperate with the best drivers in St. Petersburg – highly professional, experienced and qualified. In many situations their knowledge and experience will help you to avoid traffic jams as much as possible in every particular situation. We provide transfers to/from the airport (railway station). When you come to a new place for the first time it's better to have someone to meet you rather than to hire a taxi. 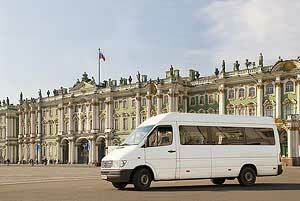 You can also rent a car with a driver for your own business in St. Petersburg or its suburbs**. We can also provide a bus. The price will depend on the type and size of the bus and should be discussed in advance. NB! If you order a car/minivan for more than 8 hours it is possible to get a discount. NB! There are discounts in winter. NB! Please mind that the cost of the car service includes the actual car operation time plus one additional hour a day for the car delivery. * We can also provide simpler cars (good all the same) at a lower price. ** Minimum order is 3 hours.